[New for 2014] After seeing 20 or so new products on Thursday in just one store, I think it's safe to say that the 2014 ice cream season has officially kicked off. The question is where do we start? Well, Nick already let us know that the Ben & Jerry's Core lineup is making a triumphant return* during his Karamel Sutra Core review, but which new flavor to choose first? Ahhhh, you know I love chocolate and peanut butter, let's do this! Yeah, peanut butter fudge.... how glorious does that sound? I'll try not to eat it in one serving... how could this go wrong? Oh my word, what in the world is this stuff, it's terrible. I was in denial for the first few bites, but this core is just awful. Sorry B&J, not sure what went wrong here, but this is so unexpected. I don't get it, I really don't. Going all natural(ish) can lead to more unique flavors and textures, but this is just not amusing on any level. It's not sweet, or peanut-y, or anything else, it just tastes awful.... so I started eating around it. The good news is there are plenty of positives here. 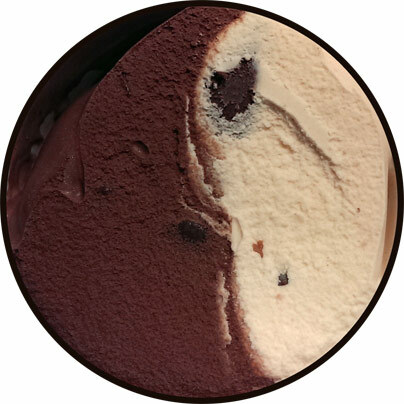 While not visible at first, the mini pb cups are indeed on both sides of the pint which helps spice up both base ice creams. Oh, and there appears to be about a gazillion of them. The fact is, this ice cream would get an easy re-buy if it wasn't for that silly core. That's all I got on this one. I'll re-scoop on Monday, maybe the core won't shock me as much then. Verdict? Everything is fine except the core! P.S. Sorry for the terrible photography! P.S.S. 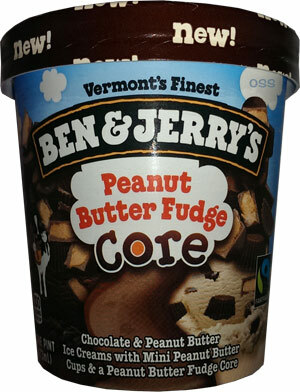 Ben & Jerry's should be making an official announcement next week about the new core flavors. Let us know if you try this one, "that's my jam", "salted caramel", or "hazed & confused". P.S.S.S. Just had a flash back to Ben & Jerry's Flipped Out! sundae cups... they too had a really weird peanut butter fudge on them that made me really dislike them. I'm thinking that same fudge might be back again! On Second Scoop: Yeah, everything about this ice cream is just fine except that silly, strange core. I guess the question will be if you can overlook the core enough to repurchase the rest of it. I know some will, even I would be tempted to buy this again to get an abundance of those mini pb cups in that peanut butter ice cream. *Note: many "news" sites seem to be ignoring the fact that the core idea came out in 2002 as "Core Concoctions". Karamel Sutra has been made ever since, though it's companions "Peanut Butter Me Up" and "Fudge Central" have long since been forgotten by most. I saw these the other day and decided that the core didn't sound all that appealing so I passed. Glad I did. You know it's bad when you have to eat around the featured ingredient! I find myself moving away from B&J's offerings these days. It just seems like too much going on if that makes any sense. I do look forward to the reviews of the other new core flavors though! What a bummer! I was looking forward to this. I have tasted this one, the caramel one, and the hazelnut one. There is nothing wrong with any of them. In fact, they are all very good. I highly recommend you buy a pint and decide for yourselves. This blog also claimed that there was something wrong with Scotchy Scotch Scotch, and that has not been the consensus on that flavor. please call me Dubba, and not "this blog". As I've said with many flavors, including SSS, any flavor has a fan base, if it didn't, they wouldn't make it. Everyone's opinions are always welcome here, but that's all they are, including mine, just opinions. these days. Out of the new core flavors I'm only interested in trying the hazelnut and the raspberry. I just tried the Salted Caramel Core and the core was the only decent part. The blondie 'chunks' were tiny little things, the ice cream itself, blah. The the core was very thick and salty, so in my case I was tempted to just eat the core. B&J is no longer in my top tier of ice cream choices. To mess up peanut butter and chocolate is pretty hard to do, so I was shocked when reading your review. Ben and Jerry's Peanut Butter Cup is my favorite flavor by them, but I wish they would make a simple peanut butter flavor with nothing else mixed in because I prefer just the plain base. Oh no its a shame that this wasn't great! We've just got something similar in the UK called All or Nutting but the peanut has been subbed for hazelnut, so chocolate ice cream + hazelnut ice cream + chocolate hazelnut fudge core and it's phenomenal! @LOC: we call it "hazed and confused" and one of us should be trying it shortly. Here's hoping the pb core is the worst of the bunch. I ate around the core too...it is really awful. The mini peanut butter cups are quite nice though. They are the same sort used in Truffle Trifecta. They hold together well and they have a nice crispy thin shell, more like well-tempered chocolate than the fudgy, greasy chocolate that is often used. I've tried all the core flavors so far and I only liked the Peanut Butter Fudge one! Hazed and Confused was edible but bland. Definitely NOT anything like Nutella! And the Salted Caramel and That's My Jam were horrible! I loved the core of the peanut butter one- tasted like those chocolate peanut butters you find at the store. i hope they at least NEVER discontinue Boston Cream Pie! for me, it's ~divine~ and there's nothing else like it! Wow, I guess I'm in the minority here. Loved this ice cream, thought it was even better than Peanut Butter World. Admittedly, the core I thought was the worst part, and even that I thought was rich and fudgy. Was not disappointed at all with this one, was excellent. I don't know I liked it. Course I ate the core mixing the ice cream with the core and it tasted fine to me. Maybe there really is a trick to eating it because it reminded me of a Peanut butter fudge I make homemade at home. it's all about what you are use to.... don't be ashamed to like it, just not for all us of. I only like the core! I hate tge pb cups.I dont like the texture, picking them out. The two ice creams by themselves are delicious, but I don't like the peanut butter fudge core at all. It has an unpleasant plastic-y taste. I know this came out years ago but I just tried this so I hope my review is still accepted. Considering a lot of people didn't like this one, I also expected to fall into that category of people not liking it. However, I absolutely loved this. I loved the core and the chocolate ice cream the most. The mini peanut butter cups tie the whole ice cream together to make it fun and exciting to eat. Peanut butter cup is my favorite flavor so I was excited to have the peanut butter ice cream component, but the peanut butter ice cream had no flavor due to the chocolate, which seemed to overpower it. But I still tasted chocolate peanut butter throughout the whole pint due to the core. With so many components - the 2 types of ice cream, the core, the mix-ins, this one was hard to put away. 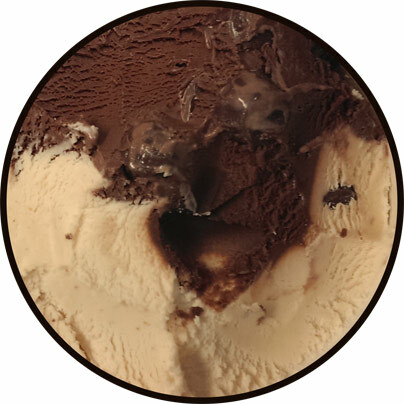 To me, it tasted like a dark peanut butter cup, which is what B&J's was going for, so that makes it a winner. 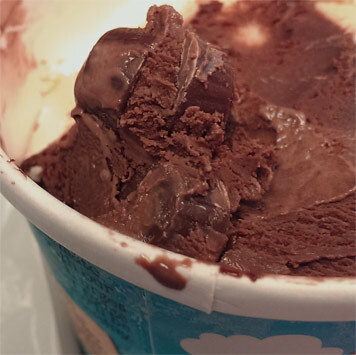 Omg I have to comment just in case Ben & Jerry's reads this blog post and changes anything about this flavor! This is the only ice cream that is consistently stocked in my freezer! I eat several spoonfuls almost every night (I'm lactose intolerant but love ice cream). I've actually gone to 5 different stores once to hunt this down because it was out of stock everywhere! I don't have a super sweet tooth... I can never finish one whole portion of dessert in a restaurant, for instance. But this flavor AND THE CORE hit all the right notes for me. I LIKE that the core is thick and fudgy but not so sweet that it makes my teeth hurt. I like to first eat the ice cream around it and then scoop out a big chunk of the core with a bit of ice cream and a peanut butter cup in one spoonful as a finale. To give you an idea of my taste profile, I'm the sort to prefer the original flavor for self-serve frozen yogurt over all the other flavors. So I guess if you're used to super sweet or intense flavors then maybe Peanut Butter Fudge Core won't be for you, otherwise, do give it a try! !